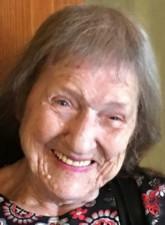 Peacefully at the St. Joseph’s Hospital, Ontario on November 21, 2018 of Marie Olive Richard aged 92 years. Olive was born in St. Peter & St. Paul, PEI on November 22, 1925, the daughter of Avie and Rosie (Perry) Richard. Funeral will be held Friday Nov. 30, 2018 at St. Simon & St. Jude Church, Tignish with funeral mass at 10:30 AM. Celebrant Rev. John Molina. Interment in the church cemetery. Arrangements entrusted to the West Prince Funeral Home.